In the picture above, north is at the top and the image covers 32 x 40 degrees. Image centre is located at approximately 12:13:01.9, -14:08:35 (H:M:S, D:M:S, J2000) Astrometric data from Astrometry.net. Corvus (the Raven or Crow) is a southern constallation of rather faint stars. 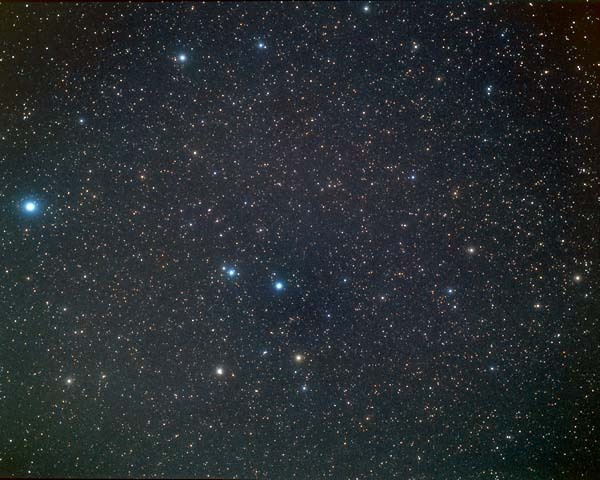 It occupies about 184 square degrees, which makes it the 70th largest constellation (out of 88 recognised today). However, it is ancient, and is associated with Crater (the Cup) and Hydrus, the water snake, on whose back Corvus sits. The grouping was recognised by Ptolemy almost 2000 years ago. Crater (Latin for cup) was also recognised by Ptolemy and covering 282 square degrees is larger than Corvus but is no more distinguished. The cup shape outlined above is barely noticable to the eye. Alchiba (α Crv), Algorab (δ Crv), Alkes (α Crt), Gienah Ghurab (γ Crv), Kraz (β Crv), Minkar (ε Crv). Constellations adjoining Corvus: Crater, Hydra, Virgo. Constellations adjoining Crater: Corvus,	Hydra,	Leo, Virgo, Sextans.